Edgar Degas once said, “Art is not what you see, but what you make others see.” Artist Sven-Ole Frahm exemplifies this idea in his practice. Like a man controlling a marionette, Frahm silently orchestrates the viewer’s interaction with his work. He draws us in with warm colors and aesthetic shapes. We are then caught in his hypnotic grasp, staring at the holes in his paintings, shivering at the strange implants pushing their way through the taut canvas. We become keenly aware of the shadows creeping in along the sides of his cut-out shapes. Under Frahm’s watchful eye, the viewer starts to question the materiality of…everything. Sven-Ole Frahm was born in Bonn, Germany in 1972. He studied architecture and then graduated from the Art Academy of Dusseldorf. He now lives in Berlin and exhibits internationally. “The Fabric of Reality” is Frahm’s seventh show with Galerie Richard, and his third in NYC. He has also exhibited with Galerie Richard in Paris, France. Frahm’s architectural background influenced his early artistic experiments, in which he cut canvases into geometric shapes and sewed them back together in unexpected formations. “In architecture you are always dealing with limitations,” explains Frahm. His early works exhibited an instinctive urge to test these limits. But Frahm’s attraction to architecture is more cerebral than pure attention to geometry. He laments society’s division of art and architecture according to the emotional capacity of each. “The planned approach of architecture can resonate with me on an emotional level,” the artist explains. “Emotion is not the exclusive territory of the artist’s studio– a cliche really– where artists are known to perform a work that is eruptive, spontaneous, and expressive.” Frahm discards of this cliche with his wildly expressive, though formally contained, paintings. The body of work in “The Fabric of Reality” continues this practice, fusing architecture and art in new ways that are both expressively and formally innovative. In Cyclops Covered with Jam, Frahm introduces three techniques that redefine the viewer’s experience with art. First, he carves into the canvas, leaving behind geometric holes of negative space. These holes incorporate whatever is behind the painting into the work, preventing Cyclops from becoming static. A white wall, a beige wall, even a stucco wall– will change the nature of the painting. A ray of light also transforms the work, casting shadows of various depths and shapes onto the wall behind. Note in this photograph the grey half moons dramatically hovering beneath each carved circle. The result is an implied depth, and a strong sensation of ambiguity. What lies in these murky shadows? And just what lurks beneath the surface of the painting? Frahm’s use of what he calls ‘implants’ gives this question even more urgency. Note the strange rectangular shapes pushing through the canvas from behind. “There is a moment of subversion inscribed into them,” Frahm explains, because these shapes draw attention to the backside of the canvas. 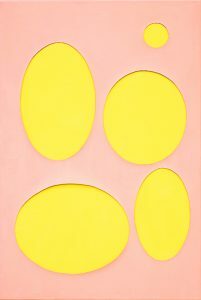 Typically, paintings are thought of as functioning one-way, or as “windows to another world.” The artist prefers to think of the canvas as a skin or a membrane. In this analogy, information flows back and forth across the canvas. Shapes formed on either side of the canvas have repercussions on the opposite side. Frahm revels in the discomfort that this applied analogy has on the viewer. In Cyclops Covered with Jam there is an uncanny sensation of something crawling underneath, pushing outwards, but we have no idea what it is because it comes from behind. In #203 Eine Hand Wascht Die Andere, this sensation is complicated by the presence of wooden blocks. These foreign objects seem to emerge from the implants, suggesting a transfer of materials from each side of the membrane. The foreign inserts are also reminiscent of the medical term ‘implant.’ “I am amused by the fact that quite a few of the techniques that I use are used by plastic surgeons,” Frahm remarks. “Stretching, cutting, sewing, and now implants.” The artist treats his materials as a surgeon would his medical tools and human flesh– with great mathematical precision. It is yet another layer to Frahm’s work that renders it uncanny and utterly hypnotizing. 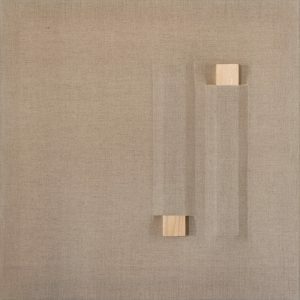 There is a third technique that Frahm employs to manipulate the viewer’s experience with his paintings. Carved holes and implanted shapes incorporate the backside of the canvas into his work. His attention to color is purely a psychological game. Note the varied shades of pink in Cyclops, as well as in Untitled (#153). I find it fascinating that each painting contains a multitude of related shades but the result feels unified. I feel that Cyclops is magenta, and Untitled is peach. It is as if Frahm paints the essence of a color, which in actuality contains many other colors within it. 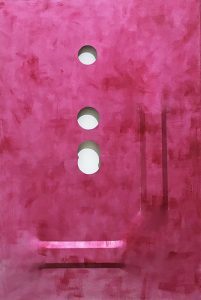 The artist is interested in “faulty colors with errors.” He doesn’t want to paint easily re-creatable colors– and how could you replicate the shade of pink in each painting, when ‘each’ is really a multitude of colors? But like his architectural practice and attention to shape and line, the psychology goes much deeper. Frahm is fascinated by the associations we have with colors. He is particularly interested in pink because it is a stereotypically feminine color. “Historically it is rather the opposite,” he notes. “In ancient pictures, Mary would always be wearing blue and Jesus– if he were wearing anything at all– would be clothed in red.” How did these color associations become flipped, and so deeply embedded in our society? Frahm’s paintings gently consider this question. I would not say that they are an overt commentary on gender stereotypes, but it is impossible to paint a series of pink works and not raise questions about gender politics. His paintings assert themselves by not evoking a strong sensation of femininity. Instead, they simply exist in their pinkness, resisting sexual categorization. Lastly, I asked Sven-Ole Frahm about his German identity, and how the German artistic tradition has influenced his work. He relates strongly to the “freedom of mind” that German art generates. He lists Dada, Fluxus, Merz, and Zero as examples of movements that liberated the minds of artists and viewers alike. “We have the power to create something more human,” Frahm explains. Rationalism and commercialism need not be the only driving forces of life. This paradigm of thinking governs Frahm’s art-making. 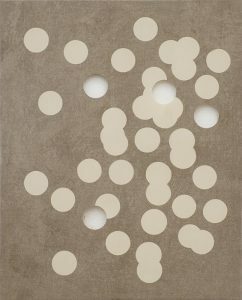 His work constantly questions the forms art can take, and the way viewers should interact with it. “The Fabric of Reality” is not to be missed. 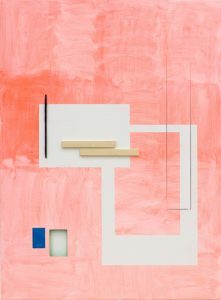 Experience Sven-Ole Frahm’s work for yourself at Galerie Richard now through June 24. Take in the colors, the light, and wonder– what lies beneath the surface of each painting? Why have I never asked myself that before?